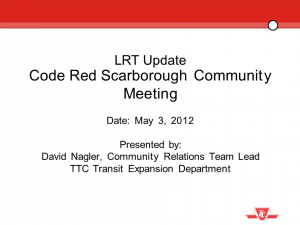 On the evening of May 3rd, CodeRedTO hosted a very successful public information session about light rail expansion in Scarborough, at the Agincourt Library. There were over 40 attendees and an hour of questions, and despite strong opinions everyone was civil and friendly, and always willing to listen to others’ opinions and concerns. So first and foremost, thank you Scarborough for being such great people! The TTC’s Community Relations Team Lead, David Nagler, gave a great presentation about the facts on LRT and what is planned for Sheppard East, such as stop spacing and roadway design as it currently stands. He also gave us permission to post his presentation here for those who would like to review. Click the image at right to download the 2MB PDF version of his presentation. 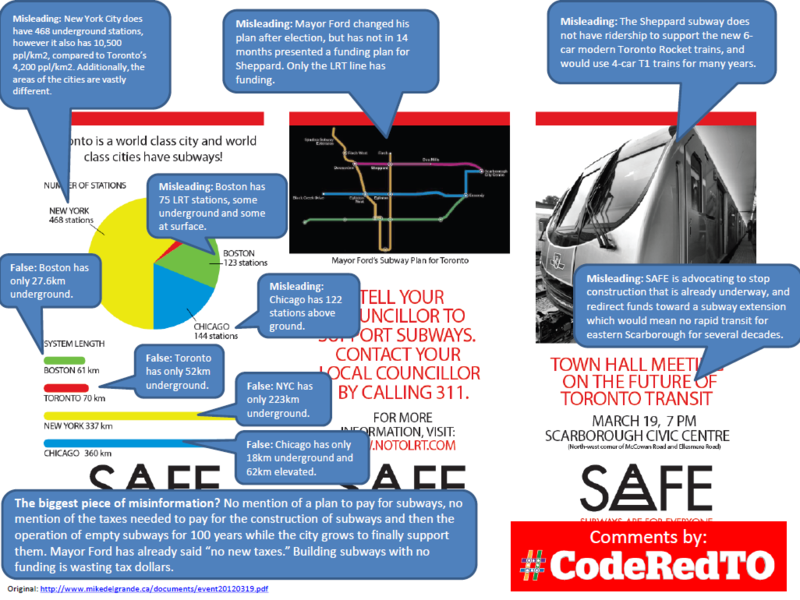 Click the image at right to download the CodeRedTO presentation in PDF format. Toronto transit advocacy group CodeRedTO will be hosting a public information session about Toronto’s coming light rail transit (LRT) expansion, on the evening of May 3rd at the Agincourt Library. This session will provide constituents with facts (both positive and negative) about light rail and the impact in their neighbourhoods. Fully 50% of the time will be devoted to questions from the public. The TTC and Metrolinx have been invited to participate to help ensure correct information is available, and we will also explain precisely what details Metrolinx will have announced on April 25th. Toronto City Council decided on February 8 and March 22 by a large majority to continue the previously approved, designed, funded, and in two cases already under construction LRT lines. However, some continue to use incomplete or misleading information about modern light rail in an attempt to derail the four badly needed rapid transit lines for Finch West, Sheppard East, the Scarborough RT replacement and extension, and Eglinton Avenue. Some elected representatives have suggested that residents would prefer the already crowded buses, and/or the higher taxes and longer timelines required for subway expansion, rather than the significant improvements in dependability, speed, and capacity closer to their neighbourhoods that light rail makes possible. However, a poll by Leger Marketing in January[Error in press release: actually February 14th] 2012 showed that given factual information comparing costs and timelines and neighbourhood impact, a majority of Toronto residents agreed with the light rail plan. This suggests, as CodeRedTO believes, that sharing more factual information can only help Toronto residents understand and believe in these expansion projects. The CodeRedTO presentation will feature content sourced from TTC and Metrolinx staff, environmental assessments, and will be posted to the CodeRedTO website afterward for others to download. Who has been invited? All MPs and MPPs representing the Scarborough areas close to future LRT lines, any Toronto City Councillors and TDSB Trustees close to future LRT lines in North York and Scarborough, and BIAs and local groups such as Respect Scarborough. Public notices are also being shared online and with nearby libraries, schools, and community centres. Today, Toronto’s city council voted to put LRT back on Sheppard Ave, finishing the resurrection of the Metrolinx 5 in 10 plan after Mayor Ford unilaterally killed it on his first day in office. 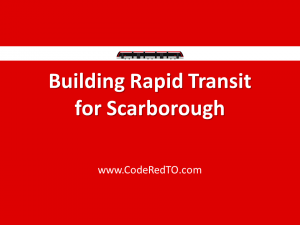 #CodeRedTO is very proud to have played a tiny part in extending rapid transit to hundreds of thousands of Torontonians. Over the coming weeks and months, we’ll be continuing our information and education campaign as the construction of Toronto’s largest-ever rapid transit network re-starts and continues. Many thanks to our supporters and those who have offered constructive criticism. And thanks go most of all to the 25 councillors who supported LRT in Toronto. Some subway advocates are using misleading or outright false information to convince, rather than sticking to the truth. We decided to help out with the most recent flyer from SAFE (“Subways Are For Everyone”). Even their name is false, since they really mean Subways Are For Just A Few People On Sheppard Near Don Mills, Nobody Else, Until We Find More Funding, Which We Can’t Do Without Higher Taxes And Tolls. Ride the Eglinton Crosstown today! Check out this 3-minute time-lapse of the 54-minute Gold Line on the Los Angeles Metro. 31km long, with elevated, tunnelled, and at-grade sections, and extensive signal priority, this video can give you a sense in some ways of what the Eglinton Crosstown LRT will be like. There are differences of course: the Gold Line features more completely separate right-of-way than the Eglinton Crosstown LRT will, and also more stops and more curves. But in many ways, you can see what our modern LRT lines may be like. Gary Webster, a 35-year veteran employee of the TTC, and its General Manager, is due to be fired at 2pm on Tuesday because of a special meeting called by 5 of the 9 councillors on the TTC board. Mr. Webster is a loyal civil servant; a strong, intelligent and competent man, whose chief failing is that he won’t mindlessly implement the mayor’s transit vision. Call Mayor Ford’s office now: 416-397-FORD (3673). Tell them you don’t approve of the Mayor’s vindictive and petty act. City Council confirms support for Modern LRT, underground where appropriate. Yesterday was an important step in restoring rational transit expansion to Toronto. City Council voted 58% in favour of the previously-approved modern LRT lines from the old Transit City plan on Finch, Eglinton, and to replace the Scarborough RT. They also voted to study Sheppard options more and report back next month. 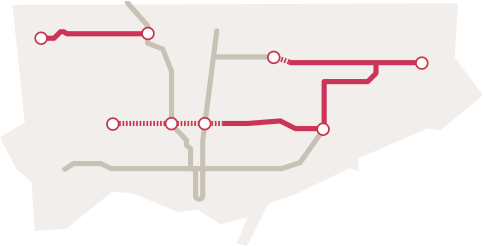 The Eglinton-Crosstown LRT will be underground from approximately Black Creek Drive to Laird Drive, underground again at Don Mills Road, and at the surface for most of the remaining distance to Kennedy station. When at the surface, it will run in dedicated car-free lanes, and cars will never have to stop or be stuck behind the long 750-passenger LRV trains. This line will be complete in approximately 2020. The Scarborough RT, due to shut down in 2015, will be replaced by modern high-capacity LRV trains running in a dedicated surface right-of-way, completely separate from traffic, along the old SRT route. Eventually, this line is due to extend to Malvern Town Centre as well. The SRT replacement section will be complete in approximately 2020. The Finch West LRT will replace one of Toronto’s busiest bus routes with modern high-capacity LRV trains. This line’s completion date is TBD. Under the old Transit City plan, it would have opened in 2014. The Sheppard East LRT is on hold pending review by an expert panel with representatives from affected agencies and neighbourhoods. Because half a subway is already there, it may make more sense to simply extend rather than commit to a mode-change in that corridor. Not yet. This is an important step, but many pitfalls await. With limited funding from the province, we can’t complete everything. There exists a real possibility that Finch or Sheppard may end up being cancelled to pay for other lines. Or that funds may be diverted to extending the Sheppard subway over a cheaper LRT line elsewhere. As well, the Mayor and his allies on Council maintain control of the TTC itself, and may provide instructions that conflict with Council’s decisions. Well OK, how do we win then? Visit the Speak Up page and contact your councillor, the Premier, the Minister of Transportation, and Metrolinx. Tell them what’s important to you in a modern rapid transit network. Learn more about how transit is handled in major cities with similar densities to Toronto around the world. Check out the mixtures of subway, LRT, streetcar, and bus in Paris, in Zurich, in Seattle, in Houston. Most importantly, stay tuned! You can learn more about what’s happening with Toronto transit from this site, and from TTCriders. For now, enjoy your weekend! The mayor has proven he is more interested in winning than in creating better transit for more people, even in his old ward. So there will be plenty of news in the next weeks and months. This has been a busy week for transit! It started out with trying to get LRT back to the surface so savings could be used for better transit elsewhere, and now many councillors are expressing concerns over wasteful spending on tunnels we don’t need – this is great progress, but we’re not done yet – this is just the beginning! Councillors from Etobicoke, Scarborough, and North York are considering their positions and the needs of residents – we need to ensure they’re hearing from us. So this means we keep up the pressure! Call your councillor! Ask a friend or loved one to email their councillor! Councillor Stintz, Chair of the TTC, especially needs to hear support from every ward to ensure she stands up for smart transit and not just what the mayor wants — remember they’re responsible to the whole city, not only their wards. I’m confused – what does it all mean? It looks like the Mayor may not have enough votes to maintain his “underground-only” plan, and his consultant searching for private money for a Sheppard expansion has said that there’s no way to get the private sector to pay for more than 10-30% of a subway. Metrolinx and the Province are annoyed because Toronto keeps changing plans, and they need a clear decision by City Council to remove this uncertainty. Remember that Council has consistently supported Transit City LRT plans in the past – in 2007 and twice in 2009. Their next vote can clinch it if they can agree on one clear proposal, and the Mayor can’t stop it if he doesn’t have the votes. The brutal truth though is that we can’t have everything. CodeRedTO strongly recommends focusing on Eglinton LRT + Scarborough RT replacement, and Finch West LRT or Upgradable BRT first. (3) Bus Rapid Transit (BRT) can improve Finch very quickly at low cost, but must be built so that future LRT upgrades are possible when needed. Just painting a new line on the road isn’t enough. This week we’ve seen many new additions to our email list! Welcome everyone! Our first big “ask” was last week: please visit http://files.coderedto.com and use the flyers to contact your councillors and friends! Tell them about the rational transit you want to see! 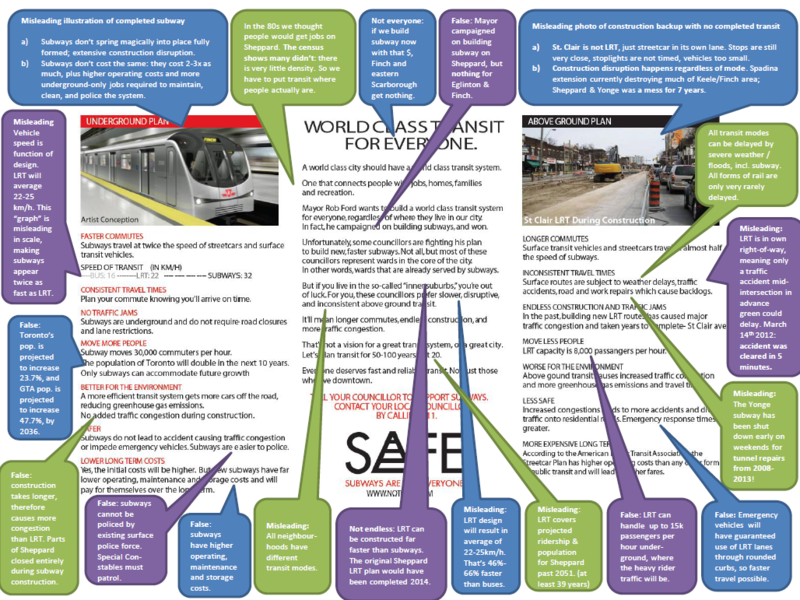 In just a few weeks we are seeing amazing public outreach and activity withinCodeRedTO and other groups — canvassing on Finch West talking to residents and commuters, a group planning to hold events to highlight funding problems that transit systems face, multiuple City Councillors publishing explanations of their reasons for supporting a system similar to Transit City, and plenty of news coverage too. This is the time to keep that pressure up, so jump in with your ideas! Want to canvass too? It’s much easier than you think: just print out some flyers and you can hand them out and people can look at them later – not very scary! All these actions collectively build better understanding of transit needs throughout Etobicoke, Scarborough, and North York! Why do we care so much about this? A story to tell your friends and family to explain why this is important: Friday, January 27th, was the very last run of the “H4” subway train. That was the one with the orange cushion vinyl seats and no air conditioning. This train was ordered in 1973, and provided over 35 years of service on the Yonge, Spadina, and Bloor-Danforth lines. That means a decision made by City Council and the TTC almost 40 years ago had an impact in 2012! That’s why we have to make smart decisions today so that transit in 2020, 2030, 2040 works for more Torontonians in different parts of the city. Thanks for reading. The future is not yet written, and you can help council make smart decisions – but only if you speak up. Email, call, or visit your councillor! Tell them what’s important to you. Remember to contact info@coderedto.com any time if you need more information – we want to help you and Toronto needs your help! – CHECK IT: new website coming soon! – PRINT IT: take the flyer linked below and spread it around! – DO IT: contact your councillor plus one friend who doesn’t live downtown! “This spirit of compromise is why Toronto is such a great city,” said Councillor James Pasternak after the final budget vote on Jan. 17. For City Hall-watchers, Tuesday was quite the day. Mayor Ford’s budget was amended significantly by council. He got his wish to limit the inflation-adjustment of property tax rates to only 2.5% (less than inflation), but he lost almost every other vote on cuts. Services were saved by councillors using existing funds, by moving them around smartly to reflect the priorities of their constituents. This is significant not just because of the votes, but because of who led the charge: council’s formerly-“mushy” middle. These councillors, many new on council this term, have voted both for and against the Mayor. Tuesday they were *mighty*, and solidly on the side of city *building*. Now that the budget is out of the way, let’s give them a new opportunity to spend existing funds in a smarter fashion – through an improved rapid transit plan! The Transit City plan would have brought new rapid transit options to about 460,000 Toronto residents in 28 wards, while Mayor Ford’s idea – still not approved by council – covers less than half the distance, less than half the population, and less than half the wards! But at the same price. This is not a smart use of Ontario and Toronto taxpayer funds. We’ve created some resources – now we need your help. – Our new website launches soon, bringing the SaveTransityCity.com and CodeRedTO.com banners together as CodeRedTO, with the goal of bring a large *smart* portion of Transit City back to life. Watch for it coming soon! 2. TALK TO ONE FRIEND OR RELATIVE in Etobicoke, Scarborough, or North York. Find out how much they know about rapid transit, and tell them what plan you want to see. If they stump you let us know – maybe there’s some useful information we can provide! 3. CALL YOUR CITY COUNCILLOR. This one is tough: if you live downtown you might think your councillor doesn’t need your call, and if you live outside downtown you might think your councillor is a lost cause. Both things are untrue. City councillors need to hear from you, especially if you live near a proposed rapid transit line. They are hearing from local businesses, retirees, talk-radio listeners and complainers ALL DAY LONG! Give them some positives to talk about! Make it personal and tell them why you think LRT would be better for your commute, and for drivers, and for kids, and for local businesses. Note: Twitter doesn’t count; make it a real phone call! 4. BONUS FOURTH STEP: write back and tell us how your conversations went! We Can Do This. But not without some effort. Unlike cuts, which were ruled out during the election, the Mayor was always clear about his transit goals (even though they weren’t realistic). We need to show councillors that his goals are not realistic, not wanted and not smart for Toronto. And we have to do it FAST – votes are coming soon! If you need info, email info@coderedto.com at any time. We’ll do our best to help!